When it comes to home remedies that are easy to give your dog, chicken or bone broth is often brought up. Whether you feed your dog a raw diet, a kibble diet, or something else entirely, broth can be a good addition to your dog’s nutrition menu. The only problem with recommending a broth diet is making sure you understand what types of store-bought broth are appropriate for your dog. The best way to ensure the broth is healthy for your dog is to make it yourself. This is super easy and can be done for chicken broth or some different bone broths. Keep reading to find out more about types of broth and what they can do for your dog as well as the rest of the answers to your questions about broth. What Is A Broth, Stock, Or Soup? The terminology of what people are referring to when it comes to feeding your dog a broth can get very confusing. Technically speaking, stock is the liquid product of boiling some bone (chicken, chicken bones, etc.) for a long period so that a gelatinous texture is achieved. 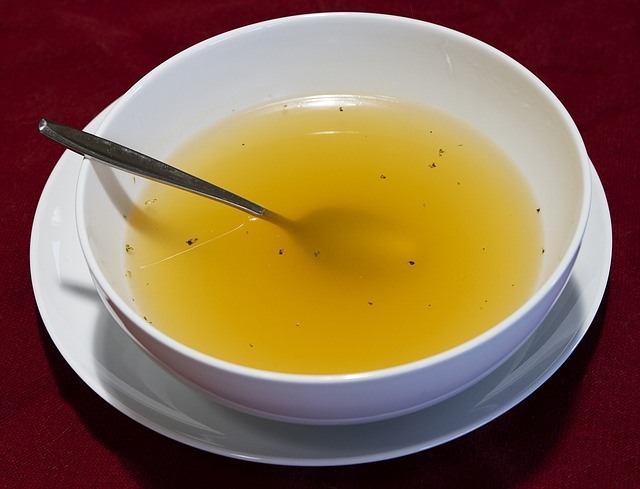 Broth refers to the liquid that is left behind after cooking anything in a liquid. Soup is a variety of broth, which just makes the whole thing more complicated! When people say that chicken broth is good for dogs, however, they’re typically talking about something that was made from a bone base. This still qualifies as a broth, but stock is also a correct word to use. Why Are Broths Good For Dogs? Bone based broths like chicken broth are great for dogs because of the healthy acids they give your dog, among other things. Broth usually contains glycine, which is an amino acid. Glycine helps your dog’s liver and kidneys to detox. These organs are responsible for detoxing your dog’s body, and glycine helps them do that. Glycine can also help keep a dog’s gut from being affected by leaky gut, a condition where the holes in the gut are too large and cause digestive problems. Glycine helps block them and reduce their size. Bone broth is also good for joints because collagen is both in the broth and collagen production is boosted by it. This means that joint health can be improved with regular broth feeding. Is Chicken Broth Good For Dogs? Yes, absolutely! Chicken broth is one of the easiest broths to find and make that can have these positive effects on your dog. Can Dogs Have Chicken Broth Bought From The Store? Yes, as long as you check the ingredients. If the broth is high in salt (or has added salt at all!) or has a lot of preservatives, you’ll want to find a better option. An organic, non-GMO stock is the best choice, but you still need to be aware of what ingredients are going into the stock. Similarly, some people have asked: “Is boiled chicken good for dogs if the chicken came from the store?” My answer here is the same. It’s good for dogs as long as you check the ingredients! If you buy a chicken to boil that has been dosed with salt, seasonings, or preservatives, this is not what you want to feed your dog! Stick to organic, all-natural options that have no preservatives when buying any chicken, bones, broth, stock, or anything else that you hope to give your dog. You should not give your dog MSG, extra sodium, or any form of garlic or onion in the product. Can I Make Chicken Broth For My Dogs At Home? Yes! You can make chicken broth at home! In fact, you can make any bone broth at home as long as you choose good bones and don’t add anything too crazy. Is Chicken Soup Good For Dogs? Chicken soup that is meant for humans is probably not good for dogs. I always recommend staying away from canned soups, even if they are labeled low-sodium, as they probably still have more sodium than you’ll want to feed your dog. If you make chicken soup at home with natural, organic ingredients that dogs love (carrots, chicken), then you could get away with feeding them a chicken “soup” that is good for them. Overall, however, I would avoid giving your dog any chicken soups that are not just liquid that is created when boiling chicken or chicken bones in water! Is Chicken Stock Good For Dogs With Allergies Or Digestive Issues? As long as your dog is not allergic to chicken, these are great choices for dogs with allergies or digestive issues that usually cause the stomach to be upset. All broth is very soothing for both people and dogs. It helps keep stomachs from becoming inflamed and has many detoxing qualities that can help your dog get over a short-term digestive problem. It’s unlikely to cause any additional side effects either, which makes it a reliable option for dog owners with sensitive dogs. What Are Some Ways I Can Use Chicken Broth? Feeding Unwanted Items: Many dogs will refuse to eat things you need them to eat. Coating these foods in chicken broth can make them irresistible to your dog! Getting Warm (Or Cool! ): Freeze chicken broth in ice cube trays and then give it to dogs on hot days to cool them down. Alternatively, warm it up a little bit and put it on their dry food on cold days to help warm them up after being outside! Making Kibble More Nutritious: Many kibbles are great but could be even better with the help of chicken broth. Just pour a little broth over the kibble to make it moist, delicious, and nutritious. For Sick Dogs: When dogs aren’t able to keep anything in their system because of illness or eating something bad, feeding them broth is a great way to make sure they’re getting some good nutrients. Is chicken broth good for dogs? Absolutely! Broth soothes digestive systems in dogs, and it’s a delicious treat that they love. Adding chicken broth to your dog’s food a few times a month will keep things interesting for them without upsetting their stomach. You can also feed it to your dog when they have an upset tummy to keep it at ease. All in all, chicken broth is a great item for dogs. Just make sure to avoid store-bought broths that have a lot of sodium or preservatives in them because you want to be feeding the brother as naturally as possible! Next time you and your pup need to warm up, make a big batch of broth for the both of you! You never force a sick dog to eat. If your dog is sick and not eating, you have to take him or her to the vet, find out what the problem is and have it immediately treated. Depending on what is wrong with your dog, the longer you wait to get it to a vet, the worse the dog will get and the harder it will be for the vet to be able to treat the problem. Emergency Vets are open 24/7. Look in your Yellow Pages under Veterinarians, find one that is open 24 hours (they are in there) and get your dog to the vet Today. The Swanson organic chicken stock in one cup has 500 mg of sodium and the fourth ingredient is onions. Can my dog have that mixed with rice? tumeric is also a great additive to chicken broth. great for inflamation and arthritic joints. I add 4 tbl to a crockpot 10 min before its done, my pits love tumeric! !